Titled ‘Home and Beyond’, the exhibition constitutes paintings by the artist executed in ink and water-colour since 2015. Drawing from observation and memory of the vegetal life in her residential garden in Delhi and those in the USA. Chameli Ramachandran has produced intimate studies of flowers such as the Sthalapadma, Champa shrubs, as well as a range of trees that display anthropomorphic characteristics in their sensuous renditions on paper. Chameli’s work embodies the artist’s admiration of nature and its constituent wonders- an impulse cultivated in the verdant landscape of Shantiniketan. where she spent her formative years. beyond mere botanical observation. Flowers and trees are translated into abstract forms with a lyrical intensity. 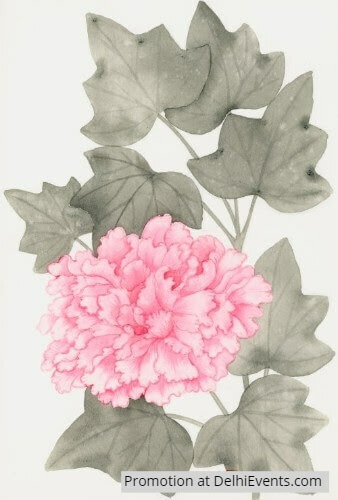 Aware of the historical representation of the flowers she depicts in her compositions (such as the lotus, chrysanthemum and peony) in Asian art, Chameli opts for an amorphous (and often haunting) performance of nature in her works that defy the limits of the page and express a wild sensuality. Tan Yuan Chameli was born in Santiniketan, West Bengal in 1940. After her schooling, in Bengali medium, at Patha Bhavana, she joined Kala-Bhavana to study art under masters like Benode Behari Mukherjee and Ramkinkar Baij. She obtained Diploma in Fine Arts and Crafts in 1960, B.A. Hons. in Indology in 1964, and M.A. in Ancient Indian History & Culture in 1966 from Visva-Bharti University, Santiniketan. The artist has participated in a number of major shows such as Millennium Exhibition, Art Today, Delhi; A Celebration of Colour, Vadehra Art Gallery and Times of India, Delhi and Mumbai; and The Drawing Wall, commemorating 25 years of Vadehra Art Gallery in Delhi.